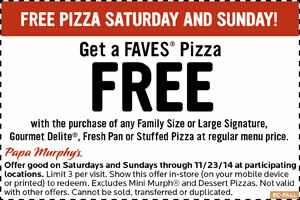 On Saturdays and Sundays at participating Papa Murphy's locations, buy a select regular-price pizza and get a Faves pizza for free via this printable coupon. That's the best freebie we've seen from Papa Murphy's. Deal ends November 23.